Clare Pettinger kicked off the first workshop session by having participants pick, from a table spread with images of food and drink, one image that represented a ‘like’ and one that represented a ‘dislike’; and then to explain, first in tables and then to the room, the reasons for their choices. As Clare explained, such an exercise can be easily adapted to fields other than foods, as a way of opening up discussion; though food does seem to be a particularly charged medium for it, a locus for emotion as well as reasoning and association. The choices of the people in the room seemed to revolve around questions of upbringing (association and habit), ethics, dietary requirements and simple matters of taste; with the ‘likes’ perhaps more straightforwardly affective than the ‘dislikes’, which brought with them a range of ethical reasonings and intellectual awareness of consequences. 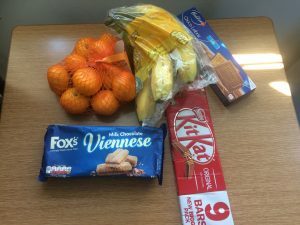 Clare then asked us to imagine how a similar kind of exercise might unfold for a 43 year old homeless man, with no family, severe mental health problems including agoraphobia and PTSD, living in a homeless hostel – what might determine the kind of food choices such an individual might make? The exercise was a grimly effective way of bringing home how for many people the idea of food choice is not an option; and how our own discussion had been made possible by our positions of relative privelege. Our food system fails the people most in need. 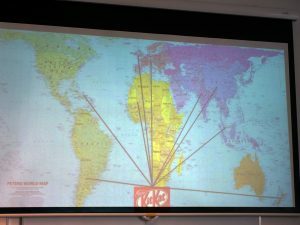 Locally or nationally, as with the second imaginative exercise; but also globally (and so the local/global theme of the first workshop returned to the fore). We generate more than enough food for the seven billion humans alive on the planet, and yet 800 million are unable to access sufficient food and 2 billion are deficient in key micronutrients – while 2 billion are overweight or obese. 25% of children aged 5 in Plymouth are overweight or obese. The reasons for this are multifarious – we might posit the end of rationing in 1954 as hinge moment in the UK; or, more widely, the exponential development of food manafacturing, of fridges and microwaves, of McDonalds. Or we could think about how these multifarious reasons might collapse back into the same, malignant causal singularity: capitalism, a system in which a rigged concept of ‘choice’ has become confused with democracy and equality. Either way – as Clare made very clear, if things don’t change then we’re all in very deep trouble. Incidentally, at about this point the workshop convenor (me) began to reflect, not without perturbation, on the contents of the bag of tea break treats he had grabbed from the nearest supermarket while rushing to catch the train that morning. Particularly as this BAG OF SHAME included a popular chocolate bar which Clare happened to pick out as an example of the crazy global sourcing and constituency of so much of our food (plaster of Paris from India to ‘glue’ together the wafers which make up the biscuit!?). And so onto another disciplinary incarnation of the overarching theme for this ‘Imagining Alternatives’ project: in our groups we were asked to select one identified ‘solution’ to the problem that is our food system from the following: power imbalance; use less resources; reduce waste; change demand. We were then to think of ways we could make this issue meaningful so as engage our communities in changing the way things are. While this exercise threw-up some brilliant wildcard options – see-through wheelie bins to make the waste we produce as households literally more visible? 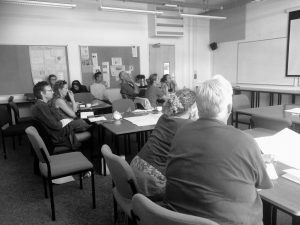 – it was telling that each group, no matter what solution they had chosen to focus on, also ended up circling around the same core ideas: communal eating, communal kitchens, communal gardens. 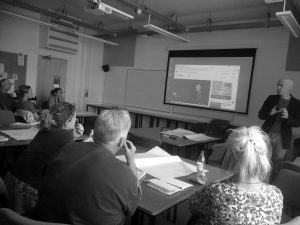 Themes which would be picked up – tellingly – by the second workshop, run by Bob Brown from Architecture at Plymouth. Bob started with two interlinked questions: how do we place ourselves in the world? How do we make ourselves at home? We were first asked to come up with ways we had made ourselves at home as a child, and then as an adult: an exercise in which people’s answers reduced – with what this participant found to be a startling clarity – to routines and rituals related to food and/or place. Bob then moved on to narratives about the future as a way of moving the session into the next phase – specifically, to science fiction as a way of clarifying some of the issues at stake here (Bob mentioned that in his experience architects tend to like sci-fi, which brought a smile to this literature scholar’s face). A brief ‘movie night’ (in the afternoon; with healthy and ethically/sustainably sourced popcorn, so making the BAG OF SHAME even more shameful). Bob showed us a clip from the Joss Whedon film Serenity, as a way of introducing a clip from the series which inspired it, Firefly: a sequence in which the multifarious travellers in a spaceship are gathered round a table: eating, yes, but also being a community: shooting the breeze and strategising, joking and planning, reflecting and entertaining. And as Bob pointed out, even though the future twenty-five years from now might bring about as yet unimagined change, reference points and rituals from the past will continue into it; indeed, might even be recovered, repaired and returned to their proper place. And so to the final exercise: to imagine what one of the ‘making ourselves at home’ activities, discussed earlier, might be like in the future. Who will be involved? When will it occur, how often? Where will it happen? And why? 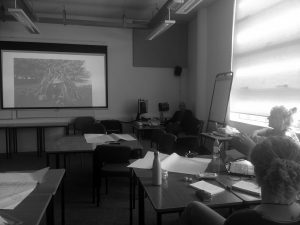 And then each group got to work with one of Bob’s Masters students – the brilliant Alston, Celine and Lizzie – to source and narritivize images and animations which might present these future imaginings in a visual form. Fascinatingly, though there had been no cues or direction to take it this way, the utopian futures which the groups came up with all involved another incarnation of the concept of communal cooking, eating and food production which Clare’s workshop had also brought to the fore. So, we had central, communal green spaces, ‘abandoned’ wilderness zones, which might act as a counterbalance to the increasing prevalence of the virtual world; to buildings which were themselves green places of food production and communal sharing beyond the unit of the family; to a ‘utopian vision’ of co-housing communities and buildings in which shared and communal spaces and activities were paired with spaces which were private and personalised, and the whole allowing for engaged self-governance and stewardship. As Bob noted in closing, these future imaginings returned to some fundamentals: people want to interact with other people, they want a sesne of belonging and coming together, but they also need space they can control and make their own (which certainly need not necessitate ownership in the sense we currently understand it). And while of course so many of these needs and preferences are mediated by culture and experience, Bob finished by mentioning the proposition that humans have an inbuilt preference for certain kinds of landscape, shaped by our evolutionary history: open spaces and secure spaces, a striking match for the combination of communal and private, outdoor and indoor, which each group had come up with. Thank you for a thoughtful and incisive review David. And thank you to all who joined in; the memories you recalled, and the visions you projected, were insightful and fascinating. Thanks for an enjoyable afternoon.